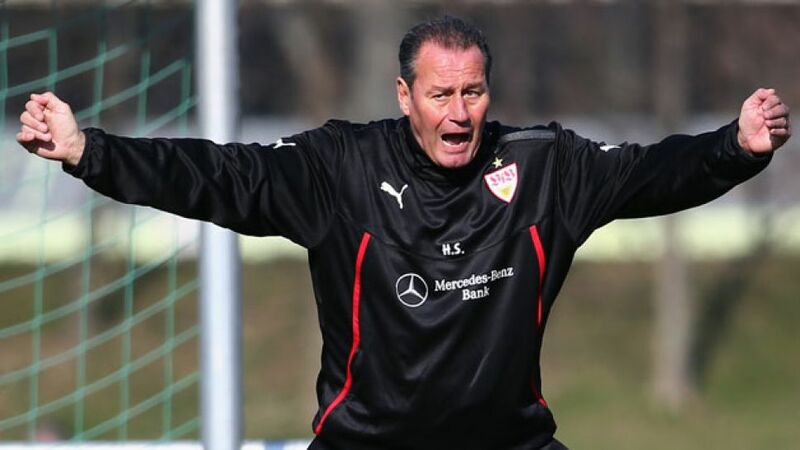 Bremen - Freshly anointed VfB Stuttgart head coach Huub Stevens faces a baptism of fire away to improving SV Werder Bremen on Saturday (kick-off 14:30 GMT/15:30 CET). The 60-year-old Dutchman was parachuted into the Mercedes-Benz Arena off the back of last weekend's 2-2 draw against rock-bottom Eintracht Braunschweig and now has just ten games left to salvage the free-falling Swabians' season. "I know it's a challenge, but I'm up for it," the former FC Schalke 04 tactician enthused. "As soon as I heard from Stuttgart, I didn't need long to say yes. I felt ready. There's going to be an incredible amount of work to do in the coming games and I'm going to talk a lot to the players. Our only priority now is to stay up and we need to focus all of our efforts into that. We need to be united." Unity is but one of a handful of qualities to have evaded the Stuttgart ranks of late, with a nine-match winless streak enough to bring an end to Thomas Schneider's 195-day tenure at the helm of Baden-Württemberg's capital club. What's more, Stuttgart have not kept a clean sheet in their last 17 Bundesliga outings. "We must defend and attack as a unit, Stevens explained. "I'm getting to know the team better with each passing hour. I talk to each and every individual. Now we just need to come to the right conclusions. It’s important that the players help one another. I hope I can put out a solid side at the weekend. Bremen take risks, are well organised and have shown themselves to be very stable of late." Indeed, die Grün-Weißen are unbeaten in their last four following Matchday 20's 5-1 thumping at the hands of Borussia Dortmund, with head coach Robin Dutt's tactical refinements helping his on-the-mend charges climb eight points clear of Saturday's floundering visitors into eleventh in the standings. "Playing off Nils [Petersen] is working well - not just for me, but for the whole team as well," admitted Bremen striker Franco Di Santo in reference to his side's favoured 4-4-2 setup. "If the results are right then you won't hear anyone complaining about the system, but I certainly feel very comfortable in this formation. I've just felt really good in the last four matches." The 24-year-old took his time to adapt to Germany's top flight after leaving relegated English Premier League side Wigan FC last summer, but is now beginning to feel more and more like a piece of the Bremen furniture. "There's this family feeling with Werder," the three-time Argentina international told the club's website. "[The families of every individual player] all come to the home matches and support us. There's a great atmosphere here."